Discussion in 'The Lounge' started by JohnE, May 9, 2012. String him up! Thieving bastage! So a co worker of mine has noticed a 3 series Trek, locked up at a temporary lodging facility on one of the bases in my area. It has been there for some time...it was there when I pulled into town last fall, sat through the winter, covered in snow. The rotors are rusty, pedal spindles rusted...a bird was starting a nest in the rear wheel. Now it is in my office. He went and popped the lock, and brought it to work..."Hey, look what I got..."I warned him against theif kharma, but he picked it up nonetheless, calling it abandoned and fair game. I call it theft...what say you all? That much rust and a bird nest? I say it was fair game, especially if it was located at temp housing. Kharma might get him, but damn, thats a long time. why would you want something that haggard in the first place? Well if a bird had built a nest in it then technically isn't it the bird's bike since he squatted it fair and square? 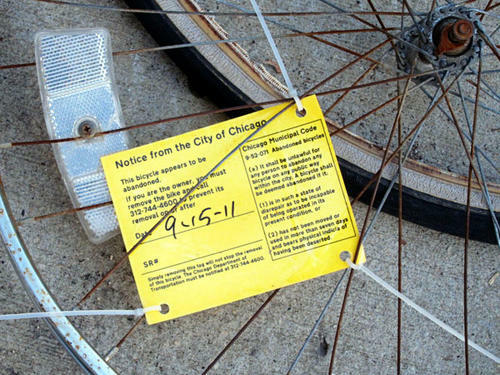 If you leave your bike for that long you deserve to have it taken. I'm surprised it lasted as long as it did, in my neighborhood that **** woulda been jacked in 2 hours haha. karma...better off believing in religion. fair game. 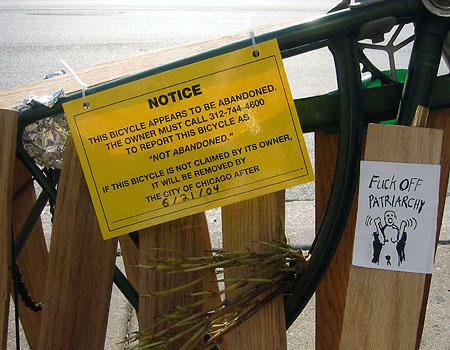 Good karma for the bike. You mentioned bases. If that's as in "Military bases", then I'd try to see if the owner is locate-able. I'd call it a rescue. I can see how some might consider it theft, but I would tend to consider it abandoned and fair game. It's a Trek, you did them a favor. It's satisfying to bring a neglected bike back to life. somewhere there's a serviceman in a hut outside some indo-kush mountain dodging ak rounds and mortars looking forward to pedaling his bike when he rotates back to the world. Okay, how about this one. There is a Cannondale locked up to the bike rack next to another guys building. He says it has been there since before he got there, at least 15 months. We have goofed with it (Turned the bars left and right, chocked the tires with rocks etc...) but it never gets corrected. He wants to cut the lock and rehab it. Chop the lock = theft or no? I say chop it...monkey thoughts? Theft is a legal term. So by that standard, look up your state's abandonment laws. It's a little quirky because of the lock, but if pressed I'd say its vandalism on the part of the original owner, and that you're curing blight. Dealing with UCMJ and Community Standards here mostly. I will give him your advice Counselor...you may have a new ustomer if it backfires on him! 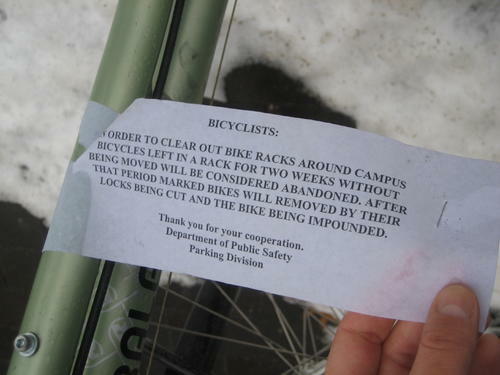 I experienced a similar situation, where a bike was locked up outside our house for about a year with winter snows and all. Sometime in May, a portly woman came around, unlocked the bike, aired up the tires and rode off. I couldn't believe it. If you don't want a moral dilemma, donate it!